Named in part after its bright fiery red color in autumn, the Flame Amur Maple makes a beautiful and sturdy hedge for a variety of settings. It is a relatively low-maintenance tree that grows especially well in direct sun or sun-dappled locations. A row of Flame Amur maple (Acer ginnala 'Flame') ready to be harvested as a 5-6' InstantHedge. 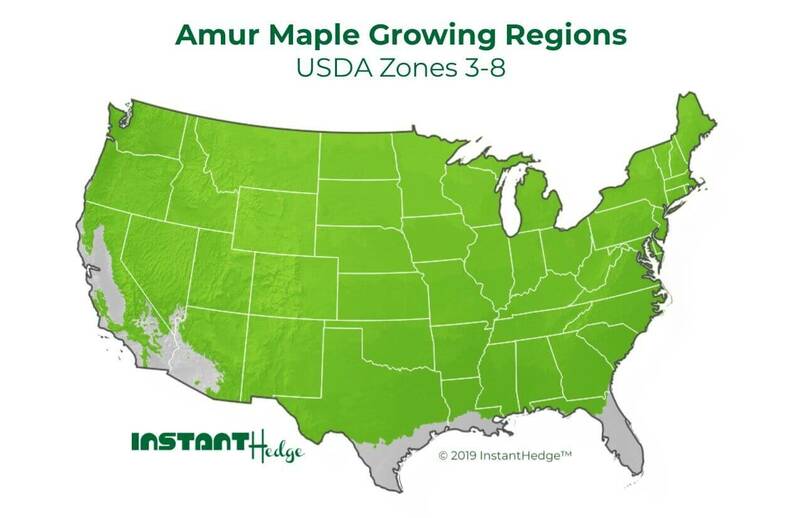 Patented InstantHedge equipment makes harvesting Amur maple (Acer ginnala 'Flame') InstantHedge very easy! After only three years of growth, the Flame Amur maple (Acer ginnala 'Flame') stands nearly 6 feet tall. In addition to the yellow or namesake red colors in the fall, the Acer ginnala Flame also produces lovely greenish-white flowers in spring. The tree is native to forested areas in western Asia and southeastern Europe, where it can naturally reach up to 20 feet. It is also known as the Tatarium maple, in reference to certain areas of Siberia and Mongolia that were invaded by the Tatars in the Middle Ages. The Flame Amur Maple grows as a small upright tree with a rounded crown or as a large multi-stemmed shrub. No major pest or disease issues. Verticillium wilt, stem canker, leaf spots, tar spot and anthracnose are possible. Watch for aphids, borers, scale, leafhoppers, caterpillers and mites. Dense, leafy texture of this Amur Maple (Acer ginnala 'Flame') discreetly blocks the busy sidewalk on the other side.